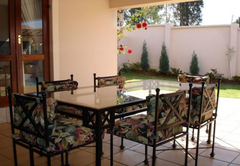 Anderley Guest House is a highly recommended B&B with self catering option, providing accommodation in Waterkloof for tourists visiting the Pretoria region. 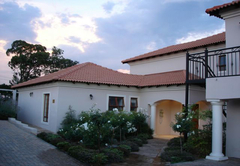 Anderley Guest House is set in a charming garden and located in the tranquil and exclusive diplomatic suburb of Waterkloof Ridge in Pretoria, South Africa. 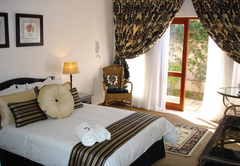 Choice of Bed and Breakfast or Self Catering accommodation is provided in stylish guest bedrooms with superb attention to detail. Your hosts Michael and Wendy provide a unique and special experience for their guests at Anderley Guest House and you are immediately made to feel comfortable and welcome. Spoil yourself by staying in one of the luxurious double rooms that have been individually decorated with superior finishes creating a fresh, bright atmosphere that immediately makes you feel at home and relaxed. 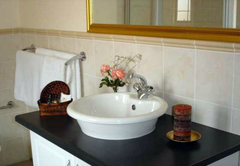 Whether you are a business person looking for peace and tranquility after a hard day's work, or a tourist to beautiful South Africa, you will find Anderley Guest House has superior service, comfort and a friendly atmosphere, that will have you coming back for more. When you slip into one of the comfortable beds with luxurious cotton percale linen, after a fragrant bubble bath or a refreshing shower, a good night's rest is guaranteed. In the morning a delicious full English or Continental breakfast "fit for a King" is served on the patio or in the beautifully furnished dining room. Our rooms do not inter-lead with each other, only older children who can sleep in a room alone, are allowed. 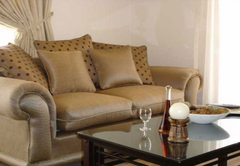 Easy access from Anderley Guest House to the main routes leading to Pretoria City Centre, Centurion, Midrand and OR Tambo International Airport. 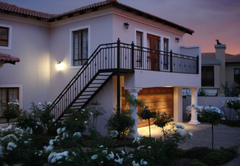 The Brooklyn Mall with its up-market boutiques, shops, cinemas, restaurants; and health hydro as well as the Menlyn Shopping Mall in Pretoria East with it's exclusive shops, cinemas and restaurants are very close by. 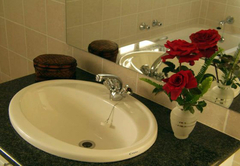 Two smaller shopping centres at Waterkloof Ridge and Monument Park are also conveniently located for guests at Anderley Guest House. 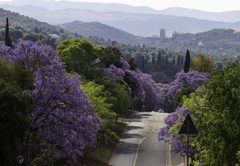 The University of South Africa, the University of Pretoria, Little Company of Mary Hospital and medical centre, Pretoria Country Club, the Austen Roberts Bird Sanctuary and many embassies are in close proximity to Anderley Guest House. Guest Room with king size bed and full bath. 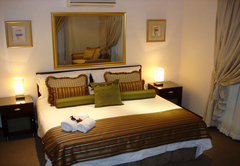 Luxury Suite with king size bed and full bathroom. 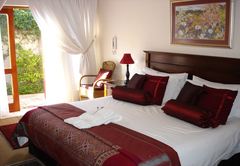 We had a great stay with Wendy and Michael at Anderley Guest House and I am making plans to go back for another stay. We stayed for just over a week. I traveled with 2 young children. Wendy and Michael made sure that we were well taken care of. They really cater to their guests and help in every way they can. Our room was clean, very cozy and had heat (which was a big deal to have in Pretoria this winter because the nights were quite chilly). Our room was equipped with wifi, a tv, and a kitchenette. Wendy brought in equipment so that I could make meals in the kitchenette. But really, Connie's breakfasts were so filling that I did not need to cook as much as I first thought I would. I highly recommend this guest house. You won't go wrong. This place is AWESOME! I\'ve never been treated better or felt more comfortable. Wendy is amazing.... this is the best! Trust me!